Obituary – Vasicek, Helen Josephine (Dolezal) « Perry High School Alumni Association, Inc.
Commerial Club ’21, Athenian ’20. ﻿Helen Dolezal Vasicek, 84 years of age, died Wednesday, Dec. 11, 1985, at El Reno Nursing Home. She was born Dec. 9, 1901 at Pond Creek OK., and grew up in Perry OK.
She moved to the Banner Community area after her marriage of Dec. 5, 1923 to Charley Vasicek. 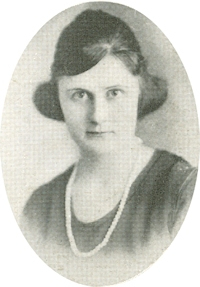 Besides being a devoted mother and farming housewife, she attended business school and worked at the Wheatland Bank. She was also a member of the WFLA Lodge 438. She loved the beauty of flowers and tending her garden. Her love for children was highly demonstrated when, at her death, she donated her eyes to her great-granddaughter, Susan Pellar, and as of this date the surgery is a success. She will be missed, as she was loved by all. Survived by her husband of 62 years, Charley Vasicek; 2 daughters, Evelyn Ellsworth of El Reno, Vera Novotny of OKC; 1 son, Eugene Vasicek of El Reno; 1 sister, Pauline Rucker of Phoenix AZ; 3 brothers, Louis Dolezal, Leo Dolezal, both of Perry OK, and Paul Dolezal of OKC; 5 grandsons, 8 great-grandchildren and 1 great-great grandchild. She was preceded in death by a grandson, Mike Novotny. Services will be at 2pm, Saturday, Dec. 14, 1985, at the Yanda Funeral Home Chapel, with interment at the El Reno Cemetery. Under the direction of Yanda Funeral Home.